In our last post we discussed the analysis a CFO might undertake when considering whether to raise capital for a litigation. We touched upon the fact that many companies do not have a portfolio of litigation – a fact which makes it difficult to mitigate the risk of investing in a legal claim. Today, we will focus on that insight and dive more deeply into idiosyncratic risk and the value of diversification. Generally speaking, an investor must be compensated for the time value of money and risk. The risk that an investor must be compensated for is the risk that the return on an asset will be lower than the expected return. While any investment in a litigation has substantial risk, the vast majority of that risk is what would be termed in modern portfolio theory as “idiosyncratic risk.” Idiosyncratic risk is asset-specific risk that has little or no correlation with the market. This risk can therefore be substantially mitigated or eliminated through adequate diversification. By contrast, “systematic risk” (in modern portfolio theory parlance) is risk that is inherent to the entire market or an entire market segment, and cannot be mitigated through diversification. To illustrate the difference between these two types of risk, idiosyncratic risk manifests if a company suffers a major factory closure due to a natural disaster (in which case the price of its stock will likely decline while the rest of the market remains unaffected) while systematic risk manifests if the global economy slows down (in which case the price of a company’s stock will likely decline, but so will the price of the larger market). Litigations and arbitrations (which we consider to be litigation-related assets) possess substantial idiosyncratic risk (each investment has a high likelihood of deviating from the expected return), but virtually no systematic risk (the outcome of each investment is highly uncorrelated with any other investment). Consider the litigation we discussed in our last post. To briefly recap, the claim had a 70% chance of winning, in which case it would yield a $30 million return, and a 30% chance of losing, in which case it would yield a $0 return. 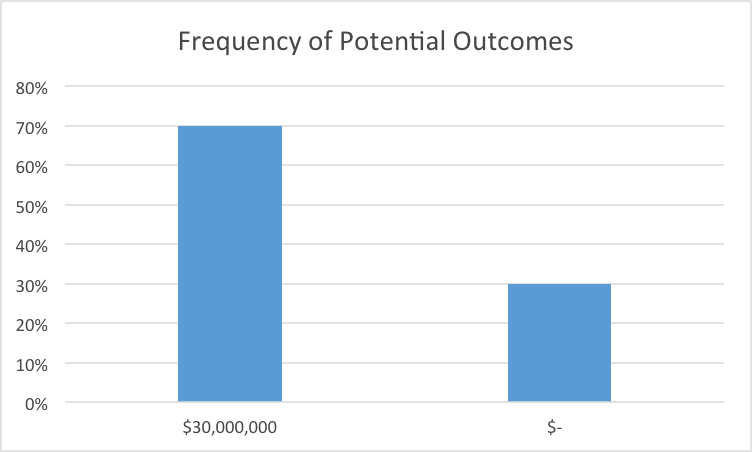 Below is a graph representing the potential outcomes of the investment. This investment has a high degree of uncertainty. While its expected return is $21 million, the company has a thirty percent chance of receiving nothing. This uncertainy is reflected in the variance or standard deviation of the asset’s return – which modern portfolio theory uses as a proxy for risk. Here, the expected standard deviation is $13,747,727.08 because the potential outcomes span a wide range of values that are far from the mean. Now let’s look what happens when we add another investment in a legal claim with the exact same return profile (70% chance of returning a $30 million award, and a 30% chance of returning $0). While the expected average return of each investment in the portfolio is exactly same as it was when there was only one investment in the portfolio ($21M), with the addition of a second non-correlated asset the chance of yielding a $0 return has dropped from 30% to 9% and the expected standard deviation of the portfolio has decreased from $13,747,727.20 to $9,721,111.05. 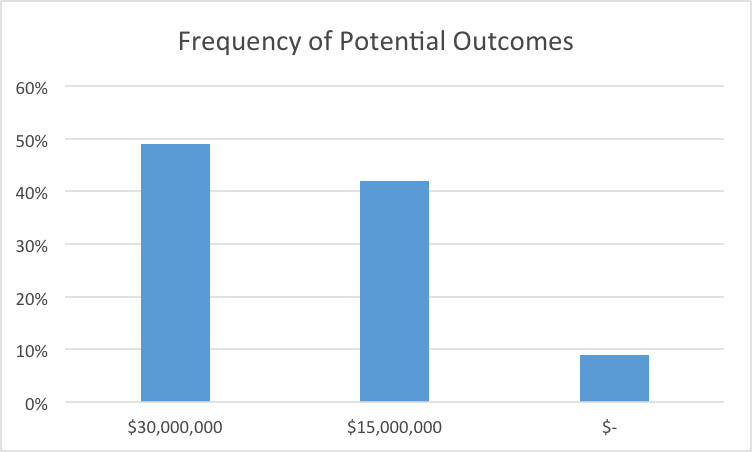 While the expected return profile is exactly the same as the two previous portfolios, the likelihood of returning anything less than an average return of $12,000,000 per investment is less than five percent, and the likelihood of zero return is virtually nil. Again this is reflected in the expected standard deviation which is now down to $4,347,413.02. Lastly, just for fun, let’s look at the return profile of a portfolio holding 100 investments. This final chart illustrates the power of diversification, and its ability to eliminate idiosyncratic risk. The expected average return of an investment in this portfolio has not changed, but the likelihood of returning anything less than $17M per investment is now less than half of one percent, and the expected standard deviation is $1,374,772.71. In other words, this means that an investor has ~95% certainty that an investment in this portfolio would yield an average return between $18,250,454 and $23,749,545 (here is a link to help understand the theory behind this calculation). Thus diversification has decreased precipitously the level of risk associated with this investment. The ability to eliminate idiosyncratic risk has substantial implications. As illustrated above, a company that invests and holds investments in legal claims on a portfolio rather than an individual basis bears substantially less risk, and therefore requires substantially less compensation for investing and holding a legal claim. Less compensation translates to a more valuable underlying asset (like a bond in which yield and bond prices are negatively correlated); this is one of the reasons why litigation financiers such as Lake Whillans are able to invest in a company’s operations and pay for fees and expenses associated with monetizing a legal claim for only a percentage of the proceeds, while the CFO of a company may have difficulty rationalizing a smaller investment for all of the proceeds.